"Waiting on Wednesday" is a weekly event hosted over at Breaking the Spine, that showcases our most wanted upcoming releases. 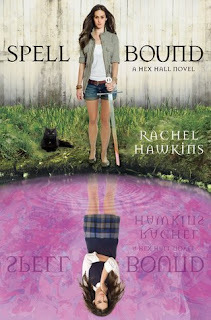 Hailed as “impossible to put down,” the Hex Hall series has both critics and teens cheering. With a winning combination of romance, action, magic and humor, this third volume will leave readers enchanted. I actually needed this one, like, yesterday!! I read the first book in the series and I really enjoyed it!! I really need to read the second one! Check out my waiting on Wednesday! Great post and happy Wednesday! I can't wait for this book (I just finished Demonglass). I am really looking forward to this one. I have really loved the Hex Hall series. I love this series. I can't wait to read this. Stop on over to my blog. New follower here!